ST. PETERSBURG, June 1. /TASS/. 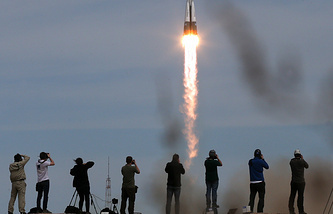 The implementation of the Phoenix space rocket project will reduce the cost of a launch from $70 million to $55 million, Russia’s State Space Corporation Roscosmos Head Igor Komarov said on Thursday. "This project will ensure competitive advantages and allow cutting the launch cost from the current $60-70 million to $55 million," the Roscosmos head said at the St. Petersburg International Economic Forum. Russia’s federal space program for 2016-2025 stipulates developing a new-generation medium-class space rocket complex (the Phoenix R&D work) from 2018 to 2025. Russia intends to spend almost 30 billion rubles ($530 million) on developing a new carrier rocket. The project’s budget financing will begin in 2018. The heads of the Russian rocket and space industry earlier spoke about the possibility of reducing the timeframe of the rocket’s development from five to four years. This timeframe is expected to be cut through the development of Russia’s available groundwork for the Zenit carrier rocket (Russia produces up to 85% of the components of the rocket that was assembled in Ukraine). Russia intends to use the Zenit rocket launch pad at the Baikonur spaceport in Kazakhstan to accelerate flight tests. Kazakhstan intends to modernize this launch pad as part of the Baiterek project to make it suitable for the new Russian carrier rocket. The rocket version for the Baikonur cosmodrome will be launched under the name of Sunkar (Falcon). The flight tests of the carrier rocket’s sea version unified with the Soyuz-5 and the Sunkar are expected to be held from the Sea Launch platform.